PARIS — The European Space Agency (ESA), following in the footsteps of the German space agency, DLR, on Jan. 8 said it had signed an agreement with Sierra Nevada Corp. to investigate a European collaboration on SNC’s Dream Chaser crew-transport vehicle. 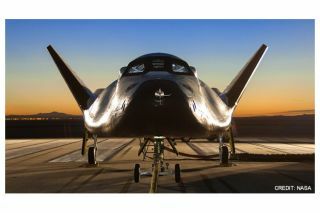 The 20-nation ESA said the one-year study with Sparks, Nev.-based SNC will focus on ESA-developed hardware that could be integrated into the Dream Chaser, reducing SNC’s development costs. One specific focus, the agency said, will be ESA’s International Berthing Docking Mechanism, being developed in Belgium, Italy and Switzerland for use at the International Space Station and in future international space exploration missions. The German Aerospace Center, DLR, in November concluded an agreement with OHB AG’s Kayser-Threde division in Munich to use German national funding for a similar study, this one focusing on Dream Chaser’s adaptability as a satellite-launch and satellite-recovery platform in orbits higher than the international space station. Bremen, Germany-based OHB, a major space hardware contractor, said a Europeanized Dream Chaser, called DC4EU — Dream Chaser for European Utilization — could be used to ferry astronauts and gear to the space station. ESA, Germany and the other partners in the international space station — the United States, Russia, Japan and Canada — have agreed to continue operating the orbital complex until 2020 and are discussing whether to extend the station’s life to 2028. OHB said the Dream Chaser vehicle, being developed by SNC as part of NASA’s Commercial Crew Program, could assure Europe a role in manned space activities after the station is decommissioned.